If you’re one of the estimated 8%1 of adults with sleep bruxism or one of the 10 million of American with TMJ Disorder2, you’re likely looking for a way to either stop grinding, relief the pain or both! After years of teeth grinding and jaw clenching, I know how you feel. It’s no fun waking up with a tight jaw, sore face muscles, and sensitive teeth. Add to that the nagging fear that the grinding and clenching will gradually damage my jaw bone or that I’ll crack a tooth if I forget my night guard when I’m away for a weekend. As you probably already know, teeth grinding (also known as bruxism) can damage your teeth by wearing them down or even cracking them. The constant jaw clenching can cause pain in the jaw joint, muscle spasms and pain in the facial muscles, as well as headaches. Bruxism can even restrict your ability to open your mouth. In addition, tooth grinding may be a factor in the development of Temporomandibular Jaw (TMJ) disorder – in which some structure of the jaw joint (ie. the cartilage or disk etc) or jaw muscles become damaged or stressed. 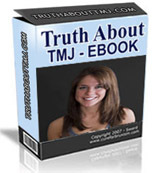 What’s the Answer to Teeth Grinding, TMJ and Jaw Clenching? There are no definitive answers amongst medical and dental professionals or researchers as to what causes TMJ, bruxism or clenching. Plus there isn’t unanimous agreement as to the best treatment for each. Despite this – there are solutions available. These options may resolve the problem or, at least, minimize the pain and prevent further damage to your teeth or jaw joint. It may take a little effort on your part to find out what works best for your particular group of symptoms. What triggers your symptoms, may not do so for someone else. What reliefs your symptoms, may not do so for someone else and vice versa. Be aware and notice if certain foods, for instance, cause your pain or stiffness to get better or to worse. Do certain situations at home or work cause you to clench your jaw? Keep track of anything you notice in a notebook. It will likely become very valuable to you! Just enter your first name and email address in the box below. 1: Neurobiological mechanisms involved in sleep bruxism.